Curtis is the debut album by American soul/funk artist Curtis Mayfield, released in September of 1970. Produced by Mayfield, it was released on his own label Curtom Records. The musical styles of Curtis moved further away from the pop-soul sounds of Mayfield's previous group The Impressions and featured more of a funk and psychedelia inspired sound. The album's subject matter incorporates political and social concerns of the time. 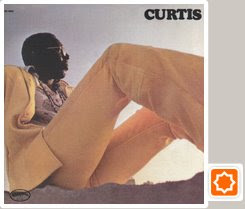 Curtis sold well at the time charting at number one on the Billboard Black albums and number nineteen on the Billboard Pop albums charts. Only the single "(Don't Worry) If There's a Hell Below, We're All Going to Go" charted. Curtis receives very high praise from modern day critics with Bruce Eder of Allmusic commenting that the record is "...practically the "Sgt. Pepper's" album of '70s soul..."
Like with some of his later Impressions work, Mayfield's lyrics reflected the social and political concern rising in black America at the time. Mayfield was one of the earliest artists to speak openly about African-American pride and community struggle. Mayfield reflected upon this time as a "happening era...when people stopped wearing tuxedos...people were getting down a little more." The album had a more hard edged sound that the Impressions had before. On this new sound Mayfield claimed it was something he "long wanted to do...but were out of category of what was expected of me and the Impressions. What I got off in the Curtis album allowed me to be more personal for myself." The two singles off the album "(Don't Worry) If There's a Hell Below, We're All Going to Go" and "Move on Up" showcased Mayfield's new funk musical style, while the rest of the tracks were much softer soul based songs. Not having any traditional music lessons, Mayfield's claimed his backing band would occasionly comment "gosh, this is a terribly strange key to play in", but still played it accordingly as written. Curtis Lee Mayfield (June 3, 1942 – December 26, 1999) was an American soul, R&B, and funk singer, songwriter, and record producer best known for his anthemic music with The Impressions and composing the soundtrack to the blaxploitation film Super Fly. From these works and others, he was highly regarded as a pioneer of funk and of politically conscious African-American music. He was also a multi-instrumentalist who played the guitar, bass, piano, saxophone, and drums.